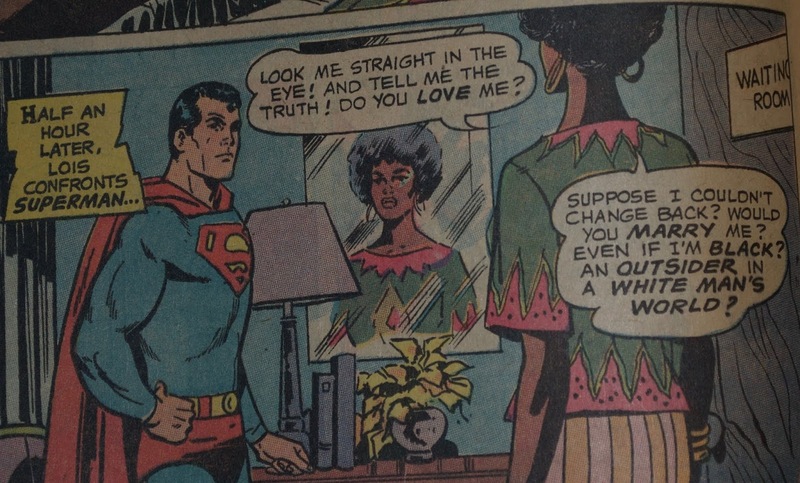 Superman's Girlfriend Lois Lane was a series that, for a decade, had mostly concerned itself with the title character scheming to trick Superman into matrimony. Issue 106, titled I Am Curious (Black) asked the eternal question "If you won't marry me at by whitest, will you marry me at my blackest?” This tale is often looked at as a source of humor and ridicule based on the premise, but it was an earnest attempt at writing a socially relevant tale. Kanigher was known for doing high quality relevance in DC’s war titles, so it was odd to see him writing Superman’s GF. He was absolutely the best choice for the time fir this kind of story. 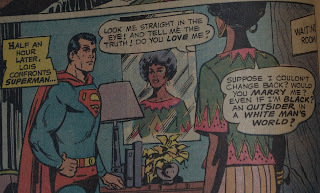 The story begins with titular Girlfriend and Reporter Lois Lane trying to get the real story of a Metropolis’ heretofore unseen black neighborhood called Little Africa. She is met with suspicion and caution. The black community closes ranks, and bristles at being treated like a news story. Encountering activist Dave Stevens, Lois learns that whitey isn’t wanted here. Unstoppable, Lois develops a scheme to get her way. 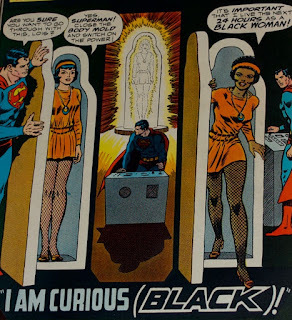 Did you know that Superman keeps a machine in the Fortress of Solitude that can turn white ladies black? Well, he does. Shockingly, this is not the first time the machine had appeared. It does some other stuff too, but this is the first time we see the “blackify” setting used. Lois seems to know all about the device and its hidden features, and asks to give it a whirl. Supes begrudgingly agrees, flying her up to the North Pole to transformation his girlfriend. Look, at least she didn’t go full blackface like the Black Like Me reporter. 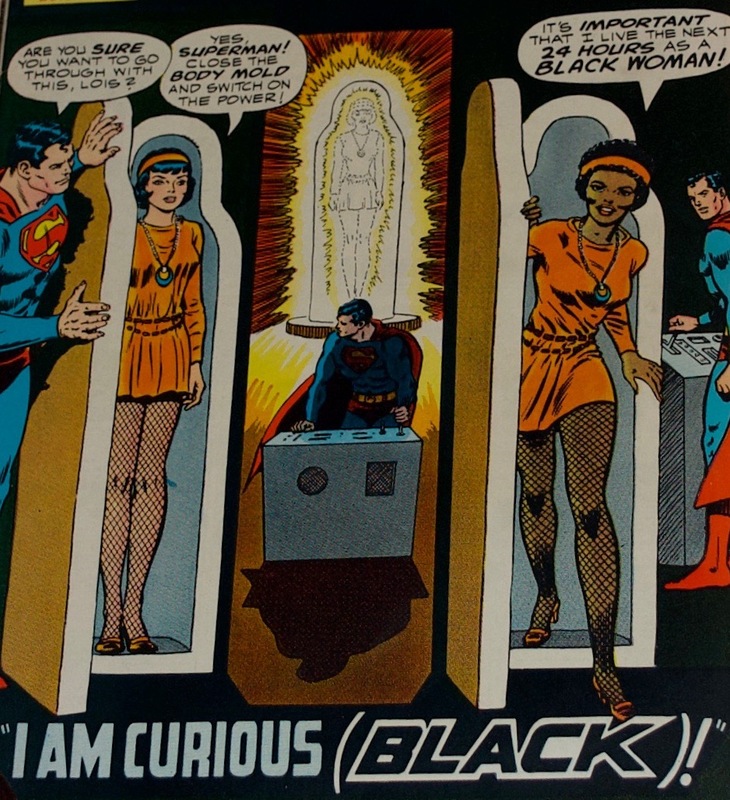 Where white Lois was greeted with suspicion as a reporter trying to get a handle on the black experience, black Lois fits right in. She spends time getting to know Dave Stevens. She is with him when a drug dealer tries to murder him. Miraculously, Lois has the same blood type as Stevens. Even though she is white on the inside, their blood is the same. Or judge not the snoopy reporter by the content of her character, but by the Super-blackface she wears. The experience as a black woman changes her perspective, leading to this heated exchange. OK, that didn’t happen. He replied with how he was an outsider or some non-committal claptrap. Kal-El Last cracker from Krypton absolutely didn’t say "Yes". As much as this story wanted to be relevant, it still had to keep the status quo for their relationship. That's too bad, because it would have demonstrated that not only Lois had changed, but that she could influence Superman to change as well. Superman would have been a stand in for the readers of the final Daily Planet story about the experience. Honestly, they did their best. This is no better or worse than any TV of the time that attempted to create a sense of empathy and understanding from a presumed white audience. That may be the biggest fault, actually. Assuming that the audience was white. I'm not sure what feelings or thoughts a black 10 year old girl would have had reading this tale. Would it be empowering, uncomfortable, comical? Would seeing representation for 7 pages be enough to make up for the other 6000 pages a year of DC comics that were entirely white? In 1970 I assume you would take whatever you could get, anywhere you could get it.